Solar Thermal systems harness the sun’s energy to heat hot water – either for domestic hot water or to contribute to central heating systems. This energy is totally free and contributes nothing to your carbon footprint. 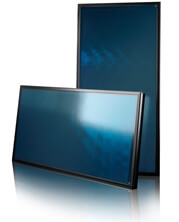 Panels can be flat plate (mounted on-roof or integrated in the roof) or evacuated tube. Typically in the UK a solar thermal system can provide 100% of a household’s hot water in the summer months. In winter it will contribute significantly although it will be necessary to be complimentary to a primary source of heat such as a heat pump, biomass or carbon based boiler. Is Solar Thermal suitable for me? Do you have a suitable roof? – Ideally south facing and unshaded, but less critical than for solar PV. Collectors can be mounted in frames on flat roofs or other level surfaces. Do you have space for a large hot water cylinder? – Solar thermal is compatible with most hot water systems and you may need to replace an existing cylinder for one with a solar coil. How much water do you use? – The savings will depend on your hot water usage, number of collectors installed and size of hot water tank. Do I need planning permission? – In England the installation of solar thermal systems is normally considered as Permitted Development with planning consent not required. For listed buildings and properties in conservation areas approval of the relevant planning authorities is required. 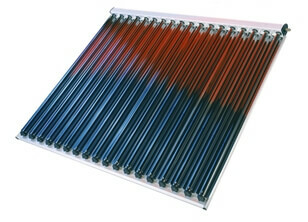 Both domestic and commercial solar thermal installations qualify for the Renewable Heat Incentive. Find out more about Solar Thermal – Call us on 0333 240 2121 or make an enquiry for a free site survey.